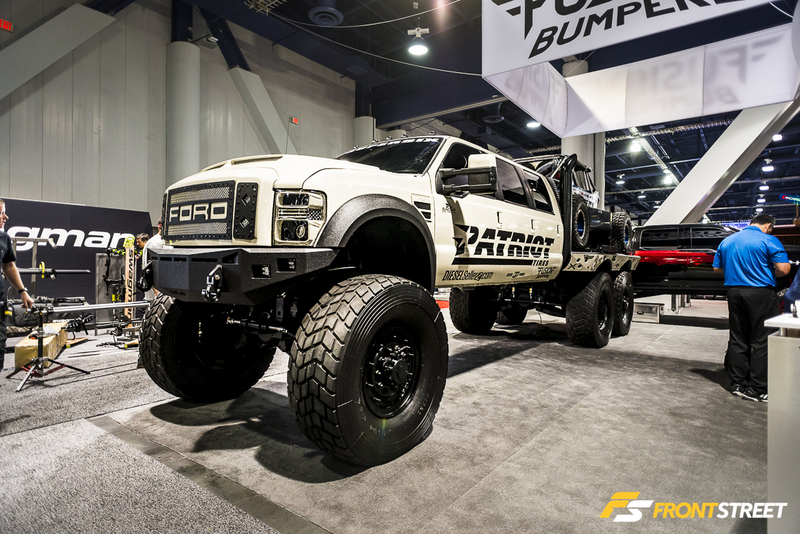 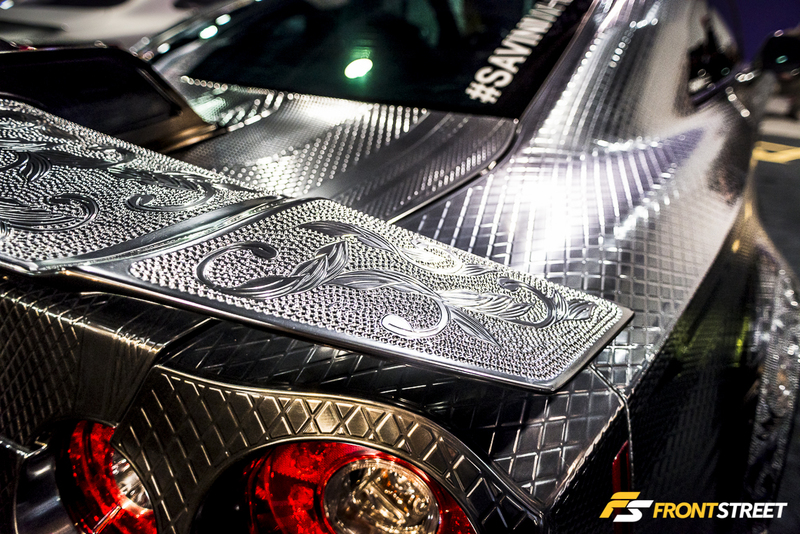 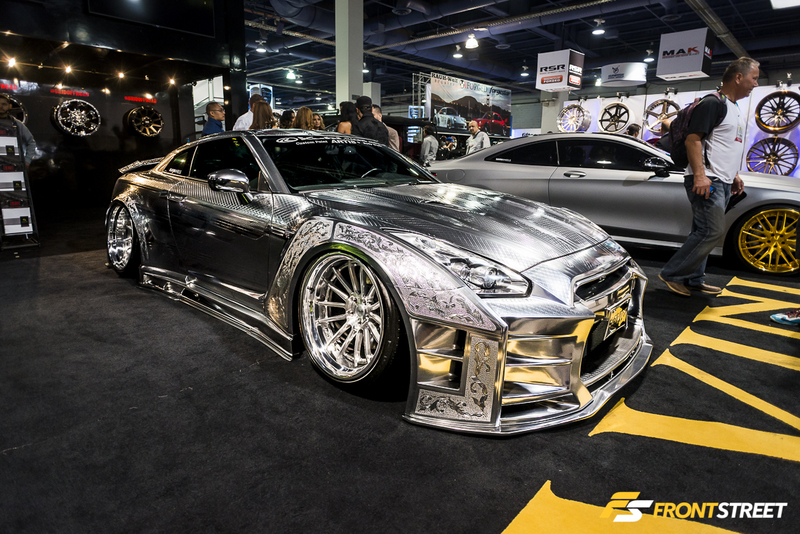 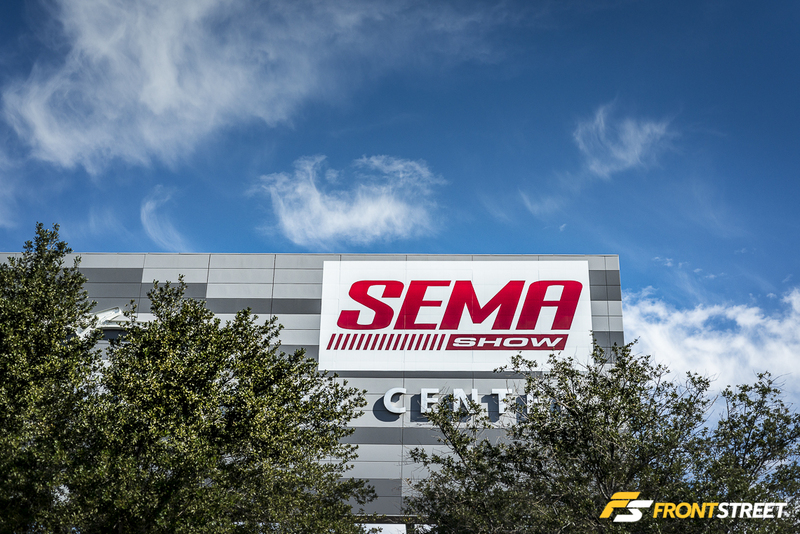 The largest trade show in the automotive world is the SEMA show. 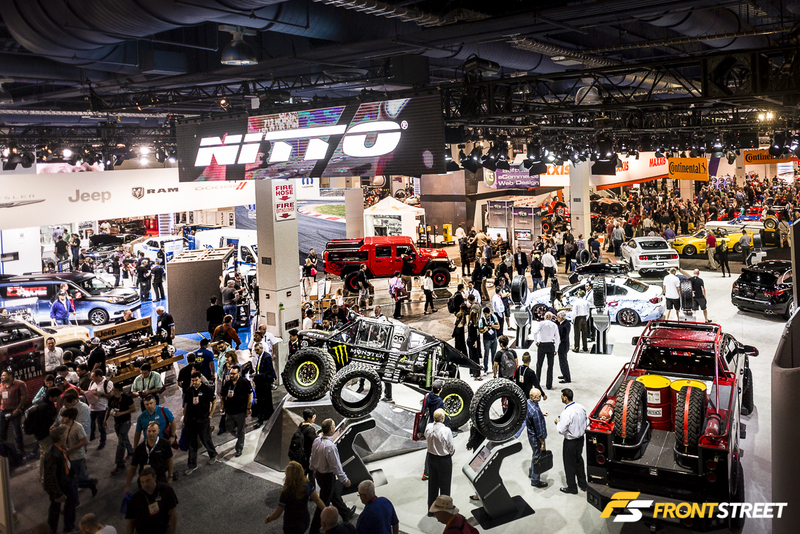 Short for “Specialty Equipment Market Association”, this convention showcases the newest products, builds, and emerging trends in the automotive aftermarket. 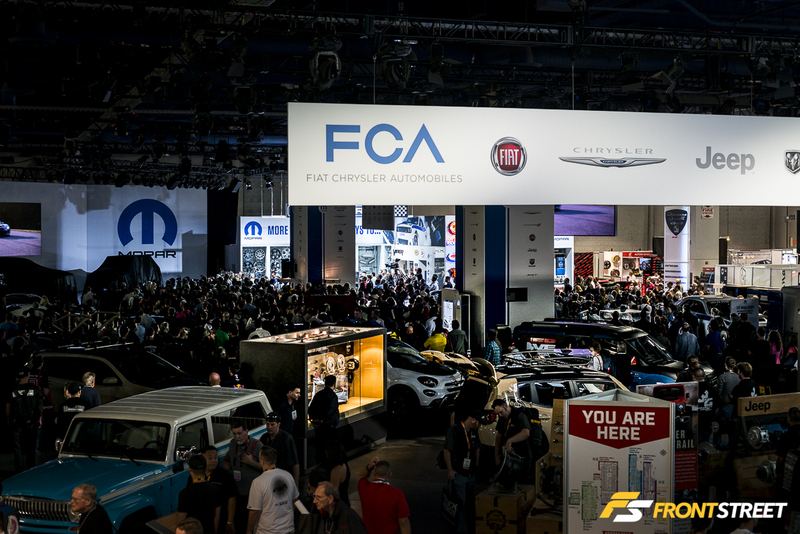 The Las Vegas Convention Center (and its surrounding lots) hosts the massive spectacle for the entire first week of November. 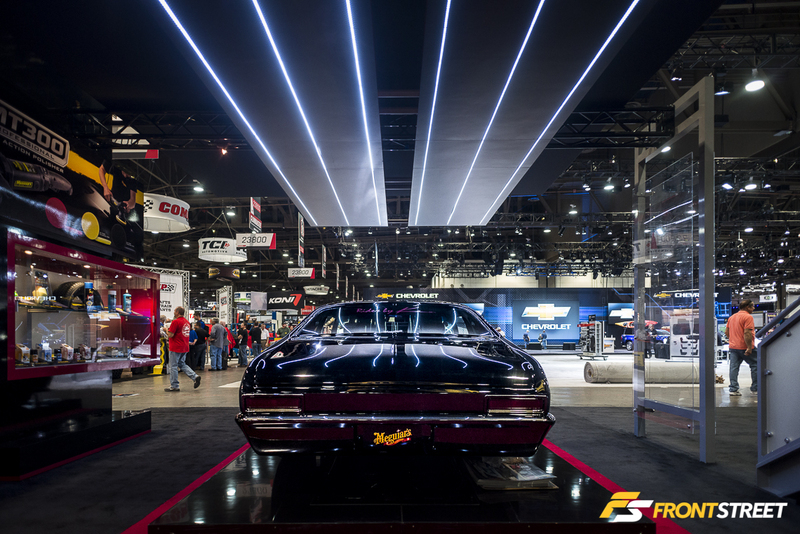 Early in the week the fair weather allowed guests to enjoy the outside displays along with the indoor booth setups throughout the 4 convention halls. 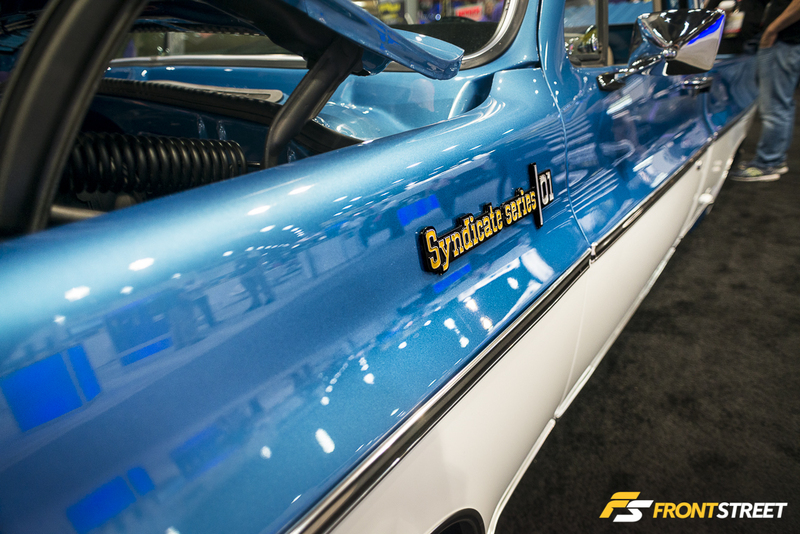 The Royal Purple booth housed this impeccably restored Chevrolet C10 pickup truck with a classic two-tone paint scheme. 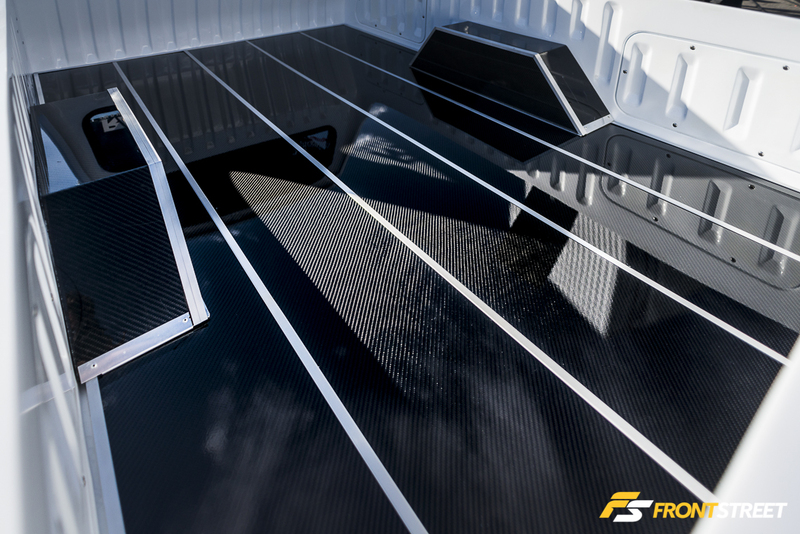 The liftable truck bed covered the hidden air tank setup used for the VIAIR air suspension system. 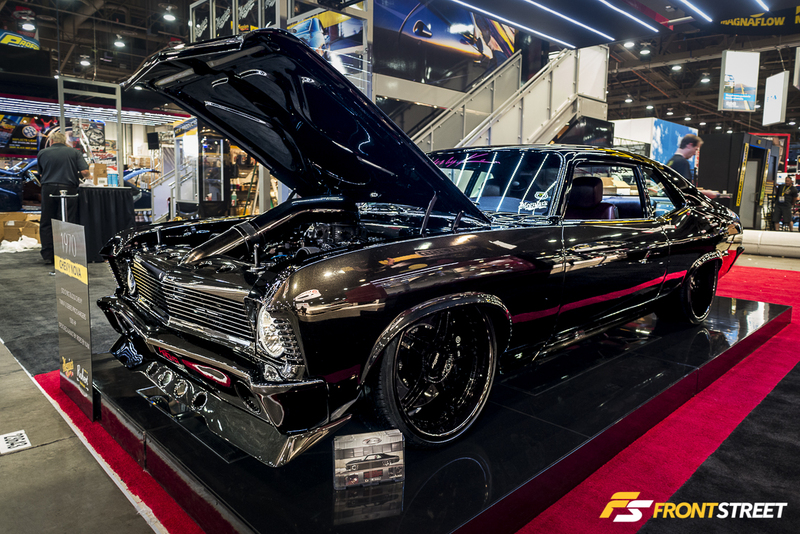 Meguiar’s booth displayed a perfectly clean black/black 1970 Chevy Nova shipped from Australia for the show. 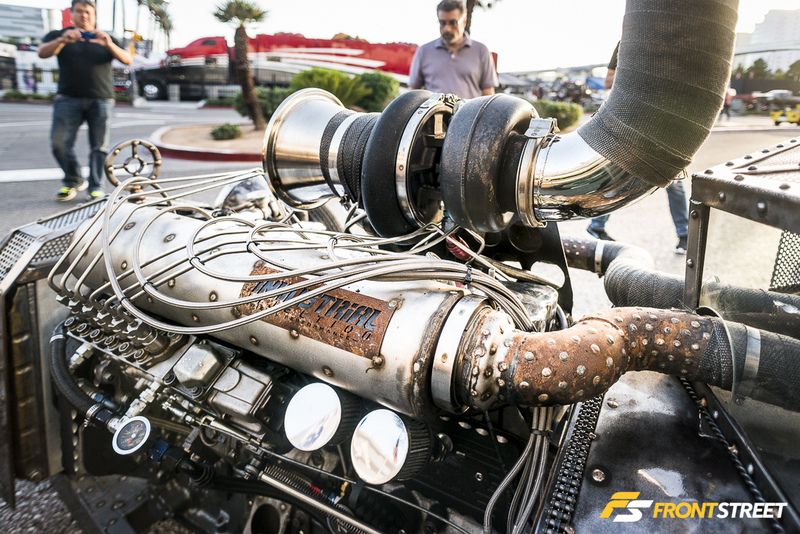 Twin centrifugal superchargers force-feed air into the engine to create the 1500hp power numbers. 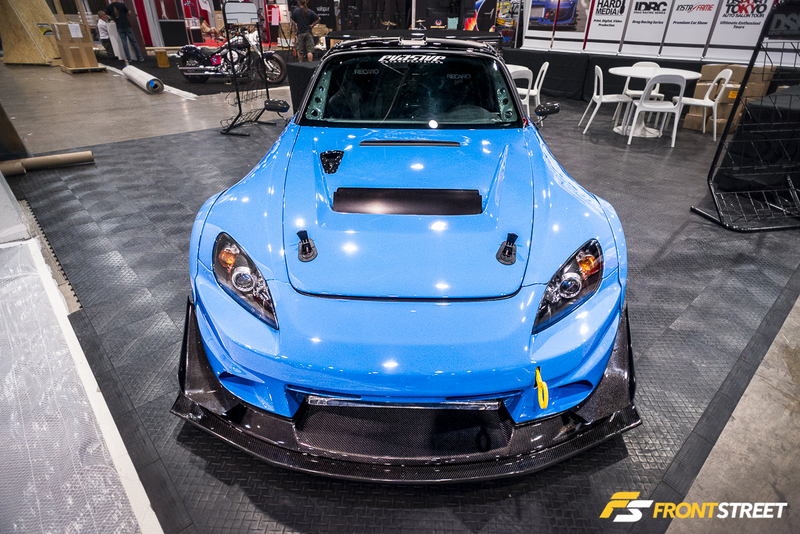 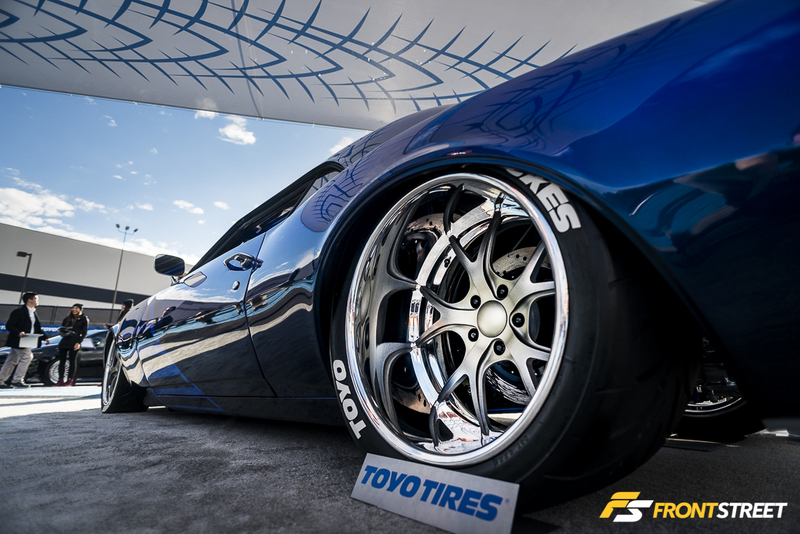 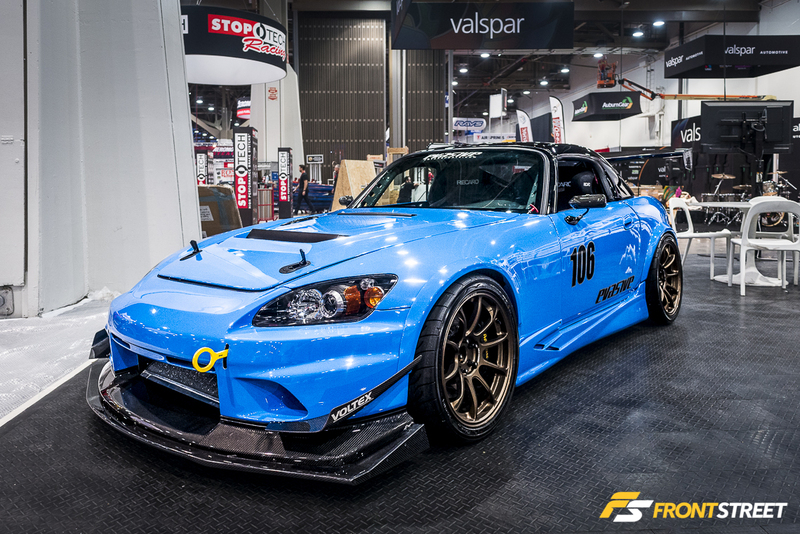 Better suited out on a racetrack than standing still in a SEMA booth, this bright blue Honda S2000 from Evasive Motorsports was equipped with Volk Racing ZE40 wheels and Voltex aero. 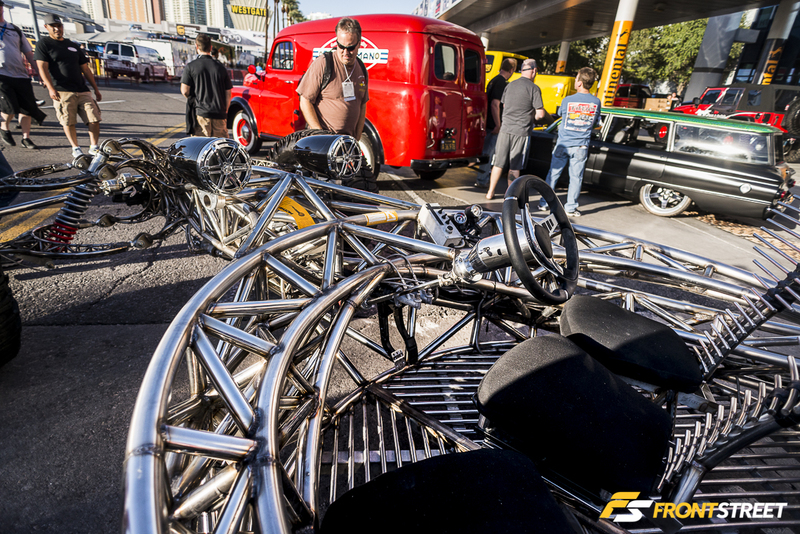 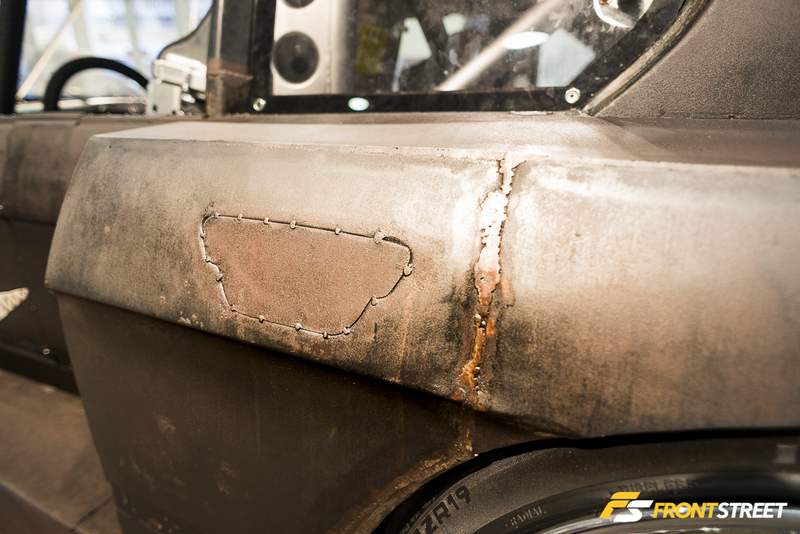 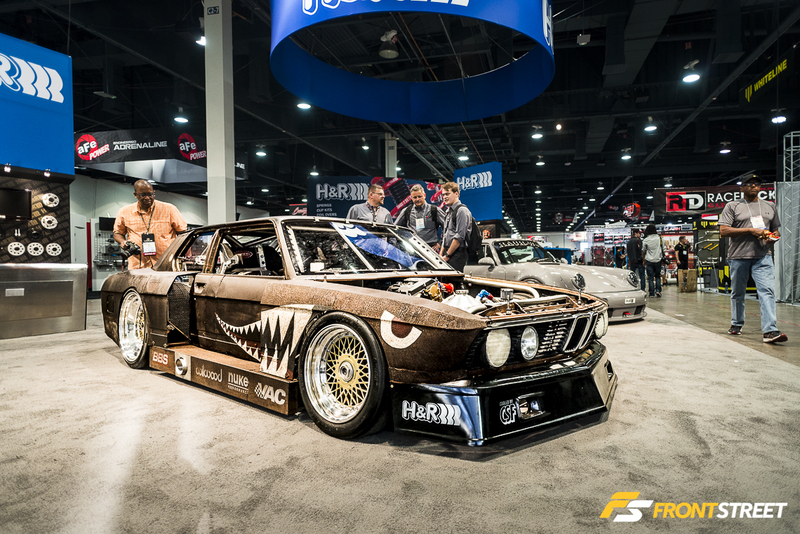 A star of the show, this BMW nicknamed “Rusty Slammington” was debuted at the SEMA show in the H&R Springs booth. 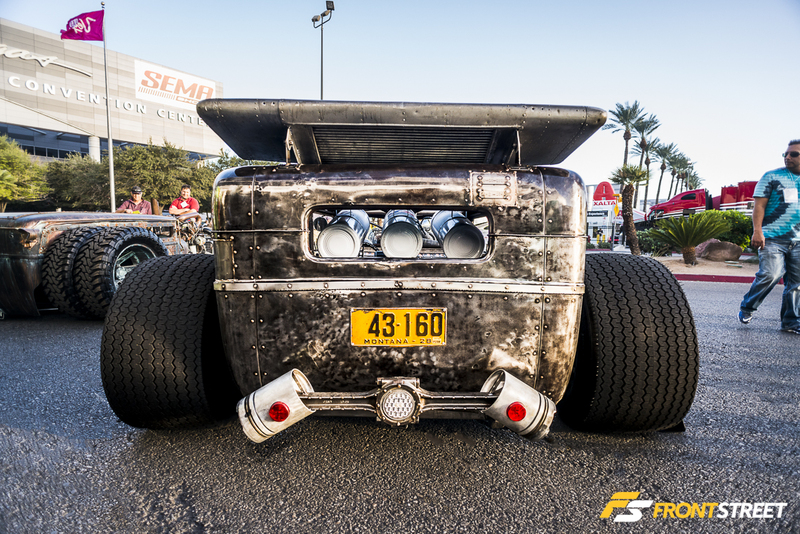 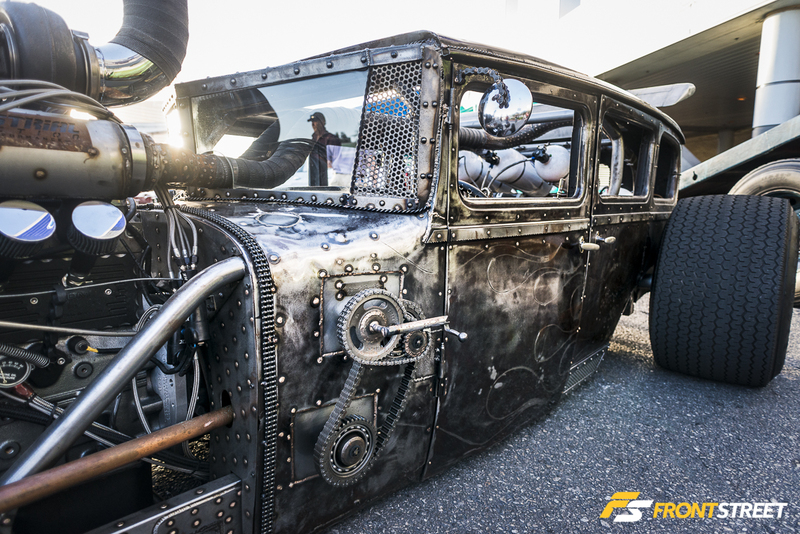 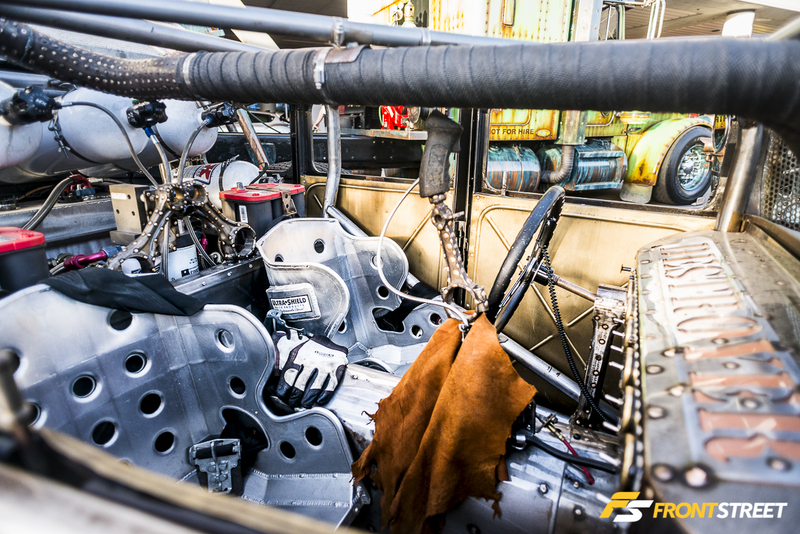 The once chopped and airbagged stance car was transformed over the past 4 years into a one-off tube chassis racecar wearing its old rusted body like a disguise. 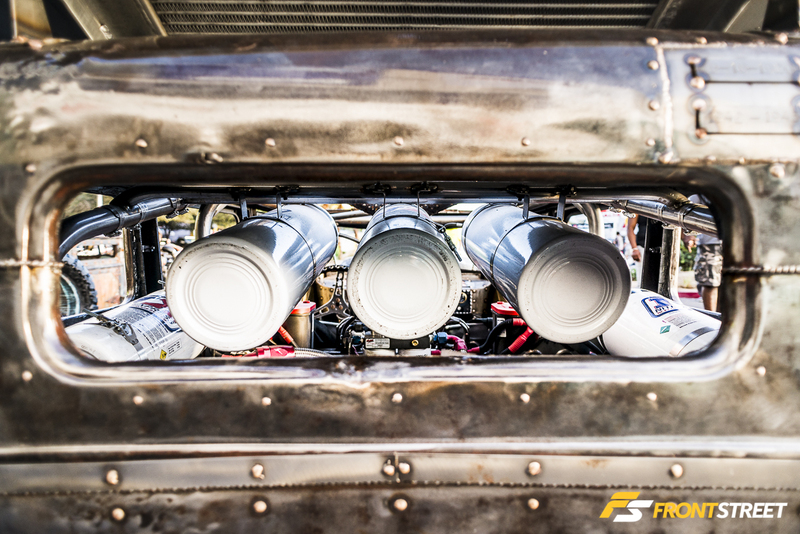 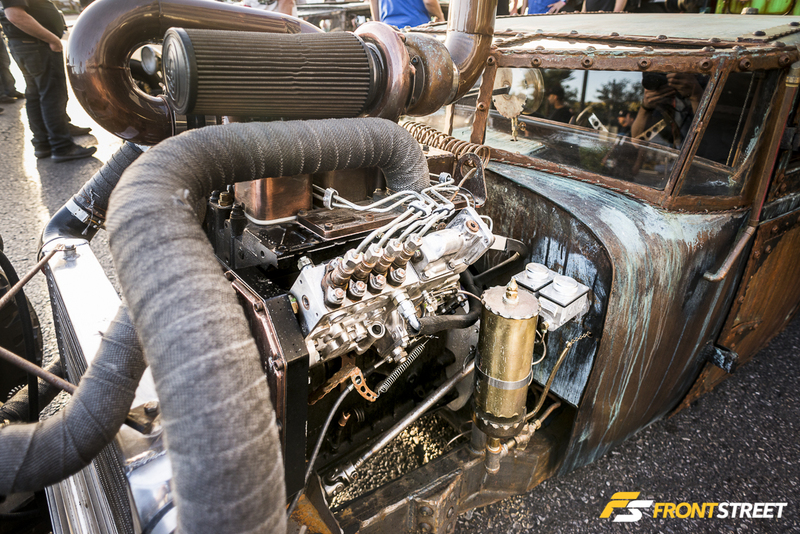 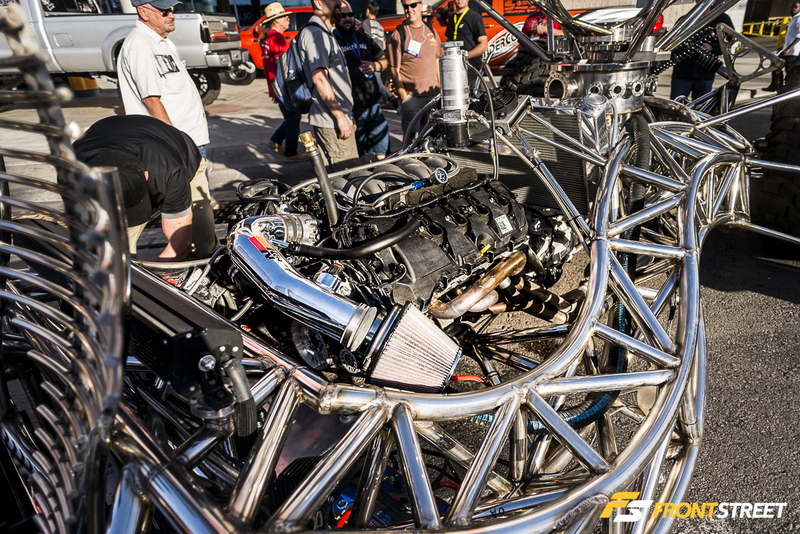 A tilted S38 covered in custom plumbing powers the car. 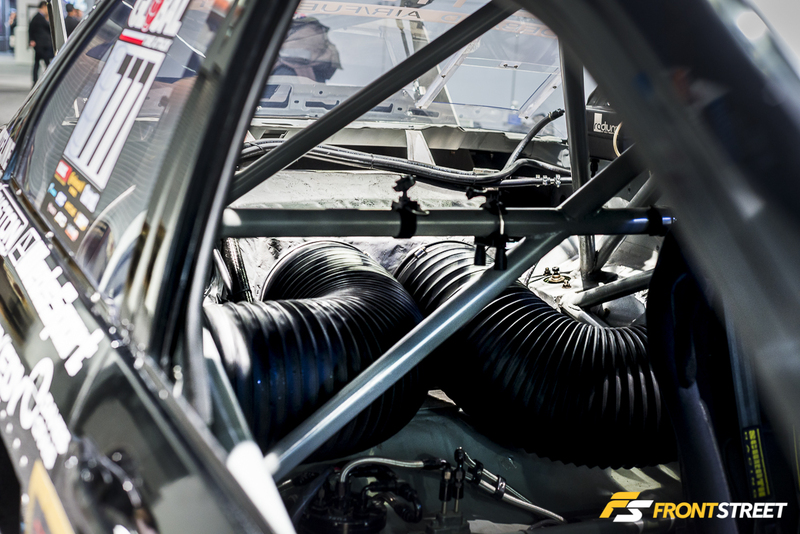 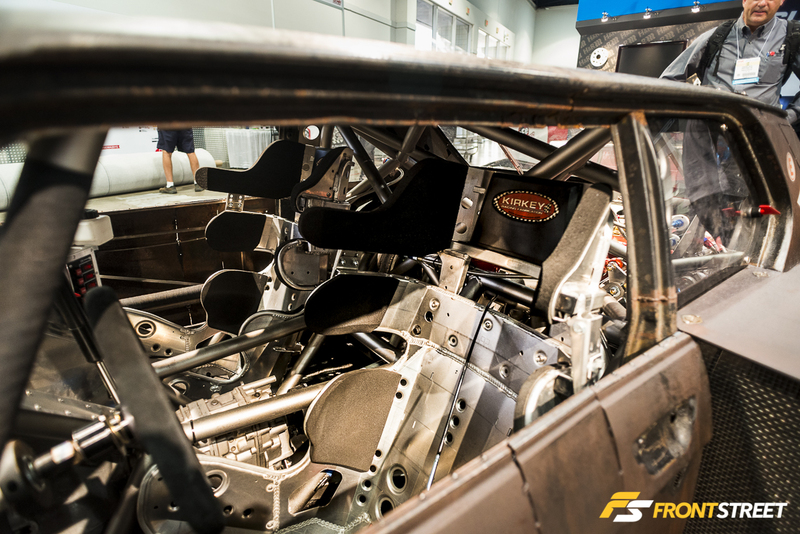 Professionals handled the chassis and motor work while the owner completed the unique touches to the body. 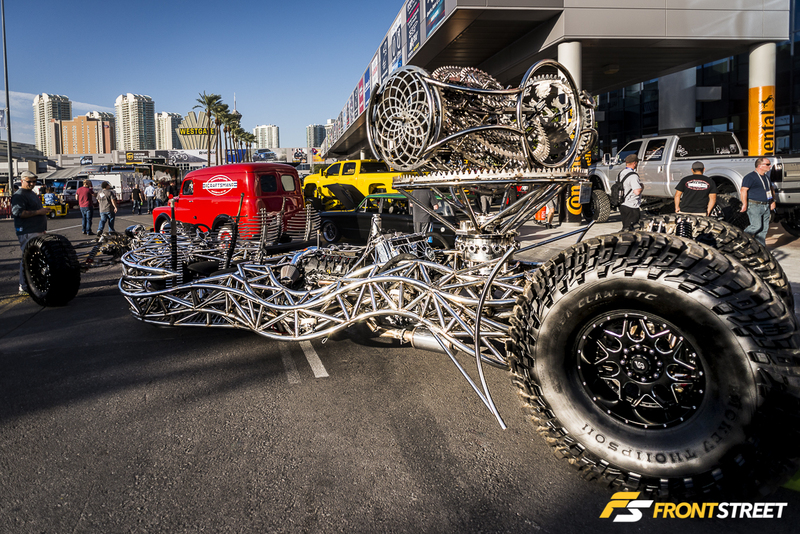 I don’t know what to refer to this as except art? 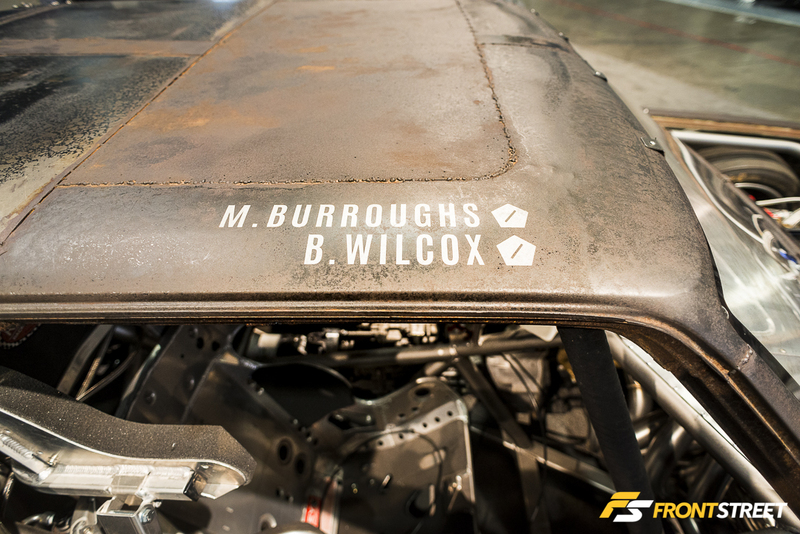 A master class in fabrication, this 5-seater Coyote-engined sculpture is littered in custom welded chassis pieces, and artistic design. 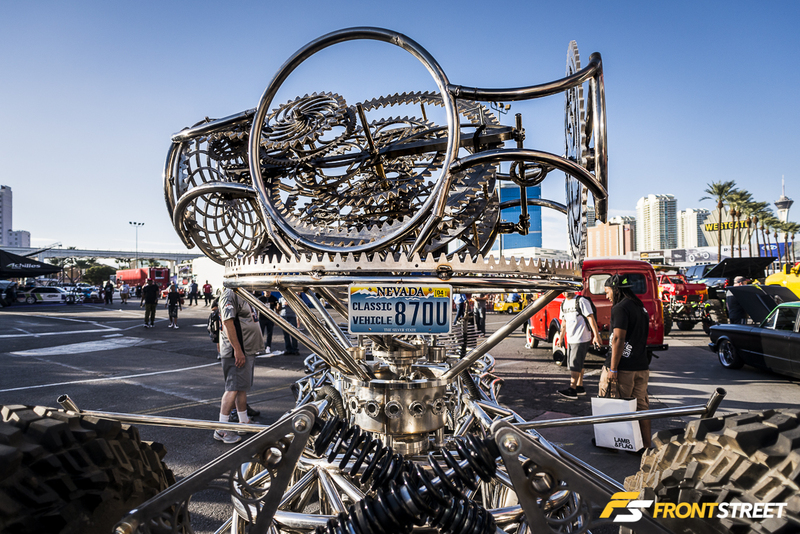 Its creation becomes more apparent in the rear, as it bares two Mutant Vehicle badges from the Burning Man art/music festival, and a gigantic geared metal sculpture. 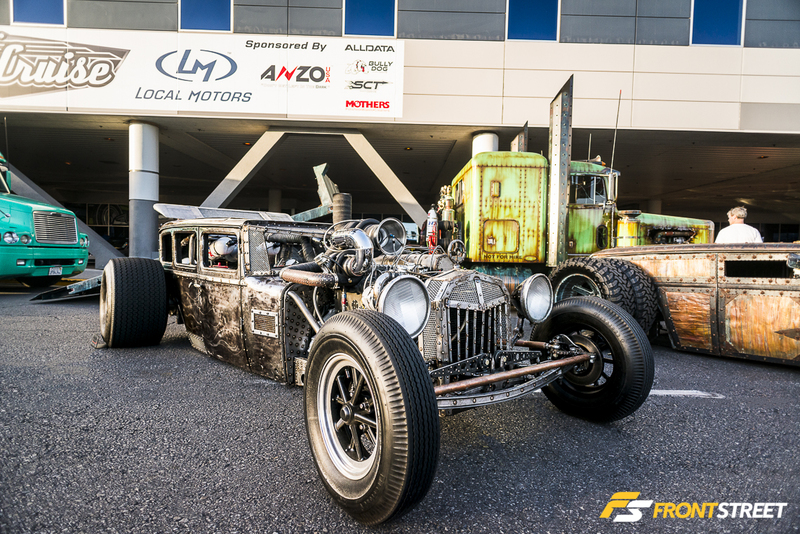 A duo of unique turbo-diesel rat rods welcomed guests to the venue. 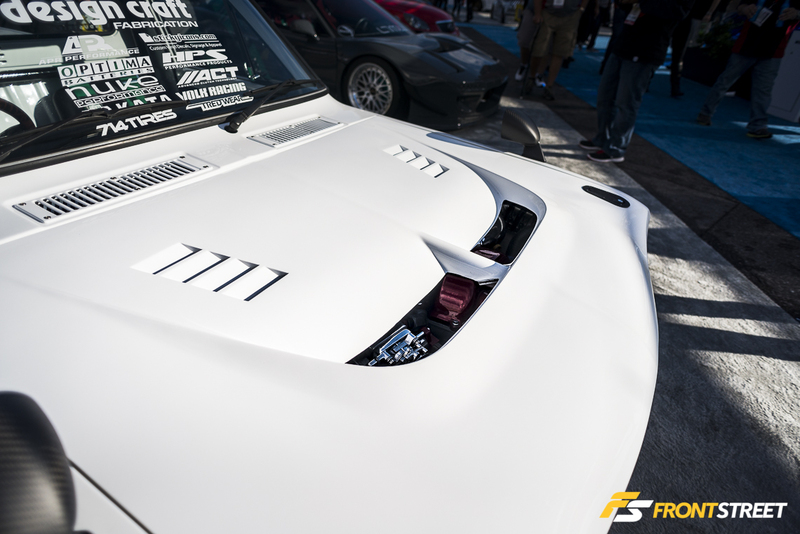 The sedan had charge pipes running through its cabin filled with nitrous bottles. 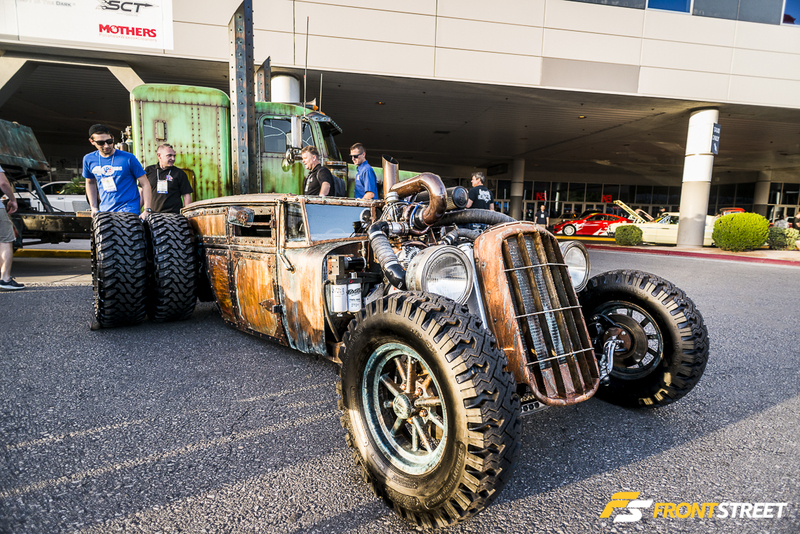 The other had a dually rear wheel setup, and side panels made from warped wood and rusted metal. 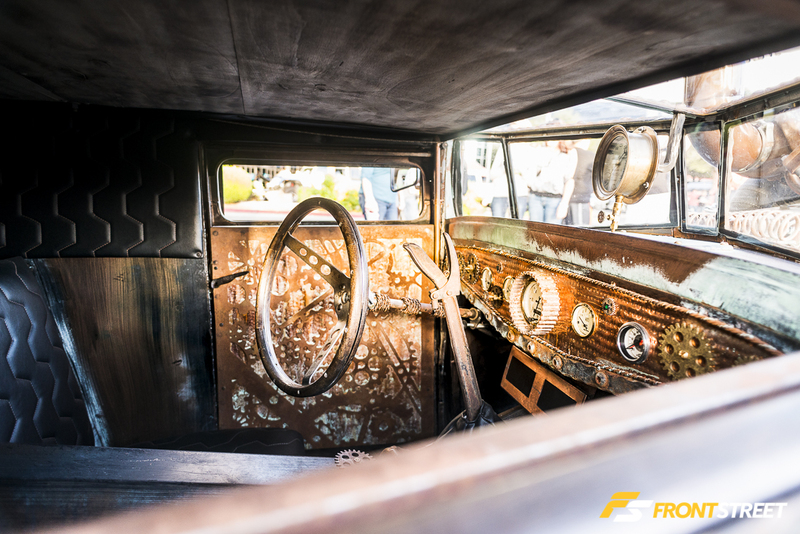 Inside the steering wheel actually sat crooked, mounted on the left side facing the right side. 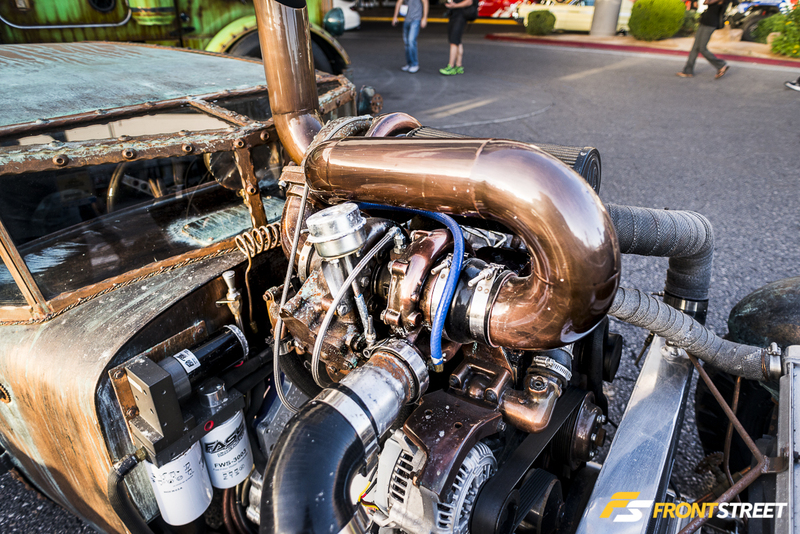 As if looking through a chopped windshield past a gigantic turbo setup wasn’t hard enough to drive. 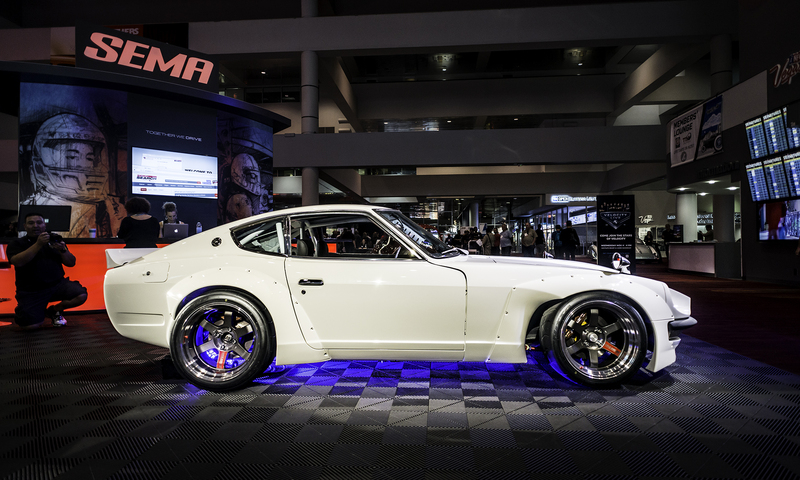 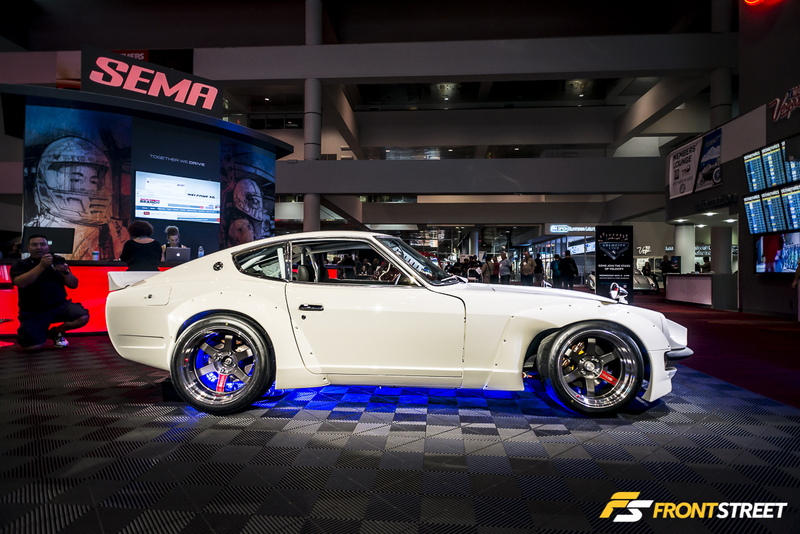 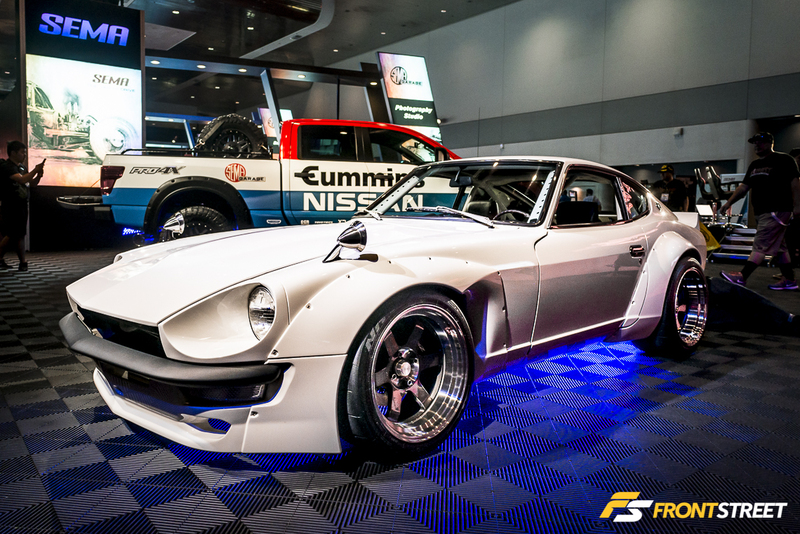 Star of the “Fast and the Furious” movie franchise, Sung Kang, debuted his Rocket Bunny Datsun 240Z built with the help of performance parts supplier GReddy. 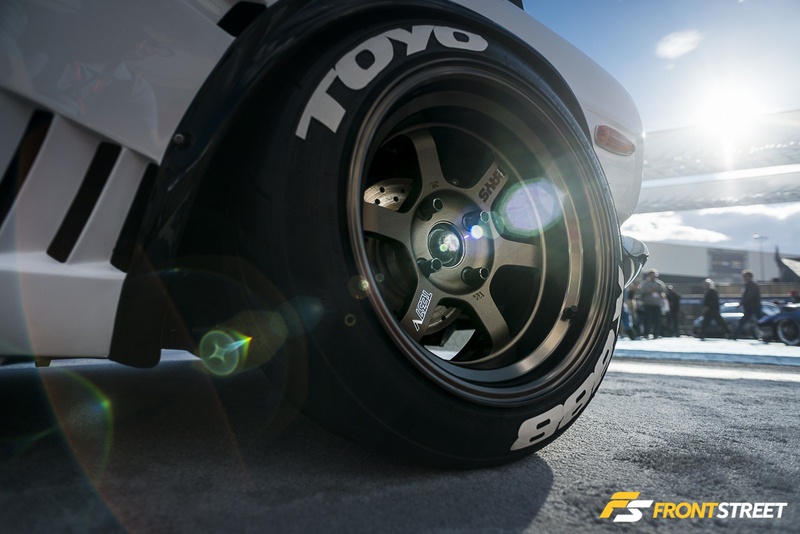 The new large diameter Volk Racing TE37V wheels filled the exterior’s wide fenders, while retro-looking seats completed the caged and refinished interior. 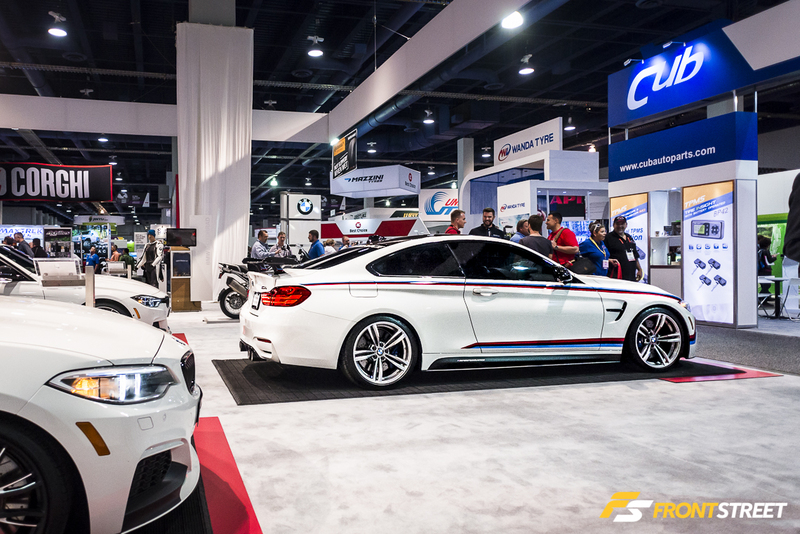 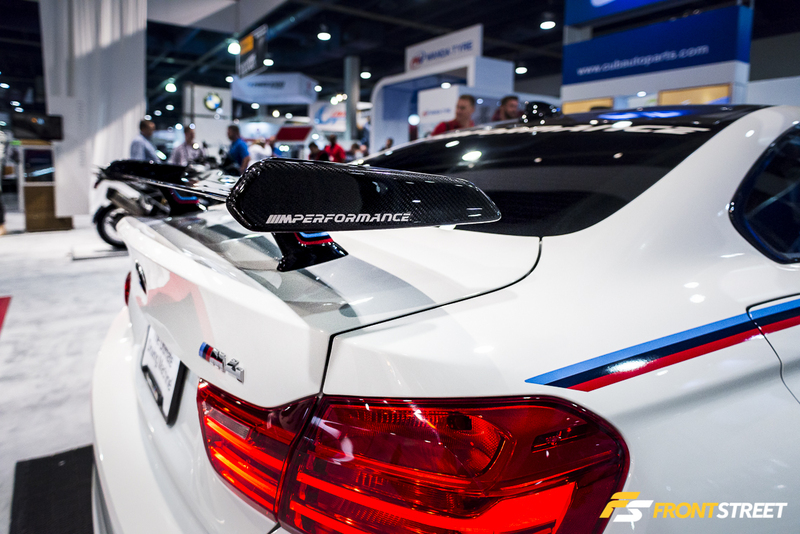 A pair of E92 BMW M3s occupied the Rolloface booth showcasing their newest products like the RF GT3 widebody kit. 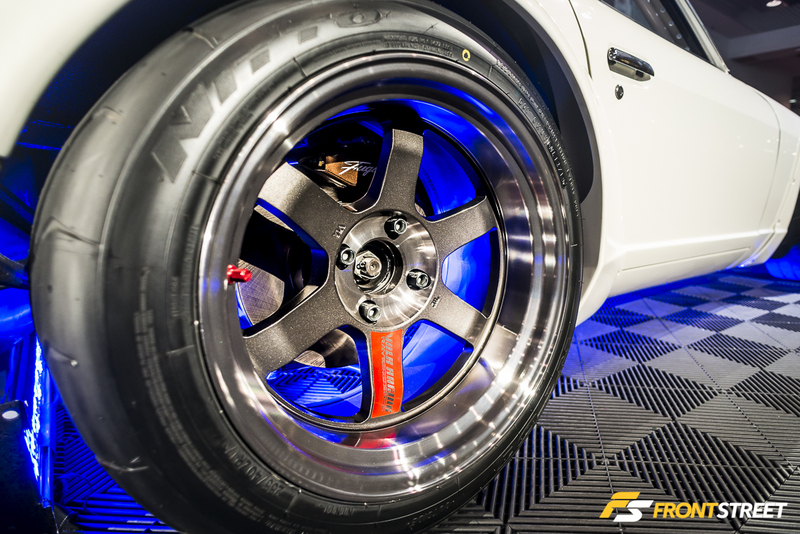 Rolloface’s ZR-1 3-piece forged aluminum wheels were mounted overtop of their custom Big Brake Kit. 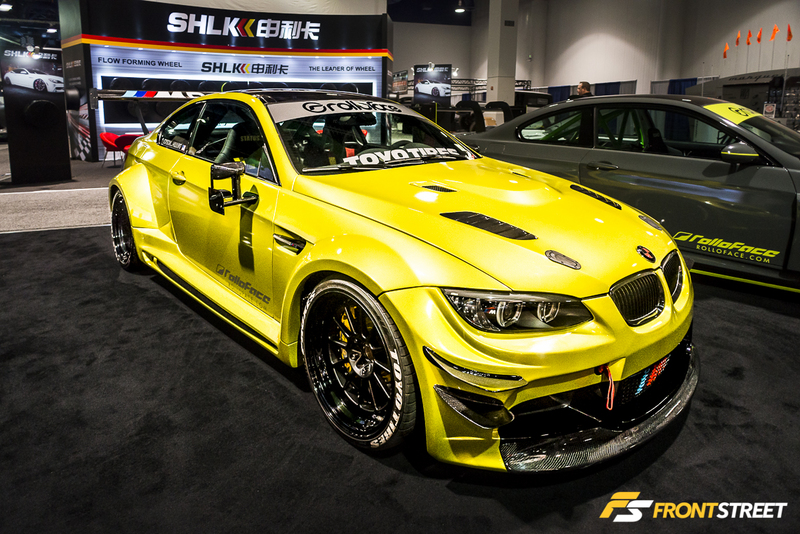 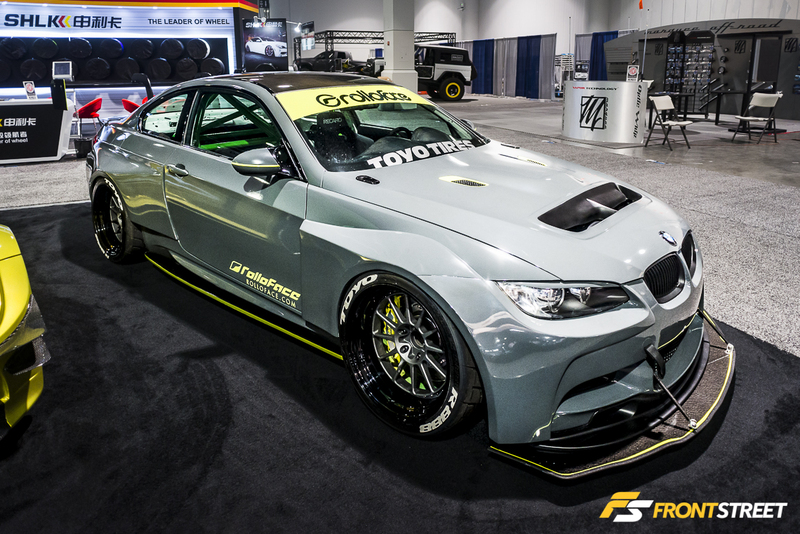 A Vorsteiner GTRS3 widebody kit extends the body wider, while mirrors from a DTM BMW M4 racecar inhabit the doors. 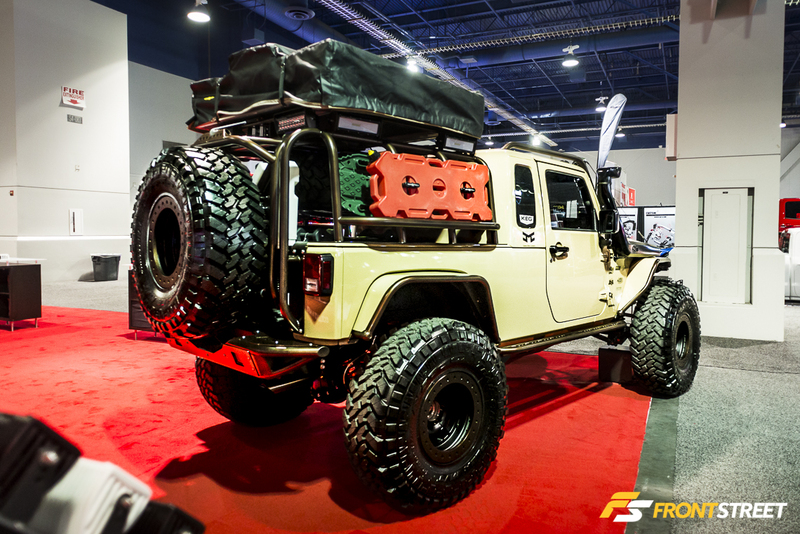 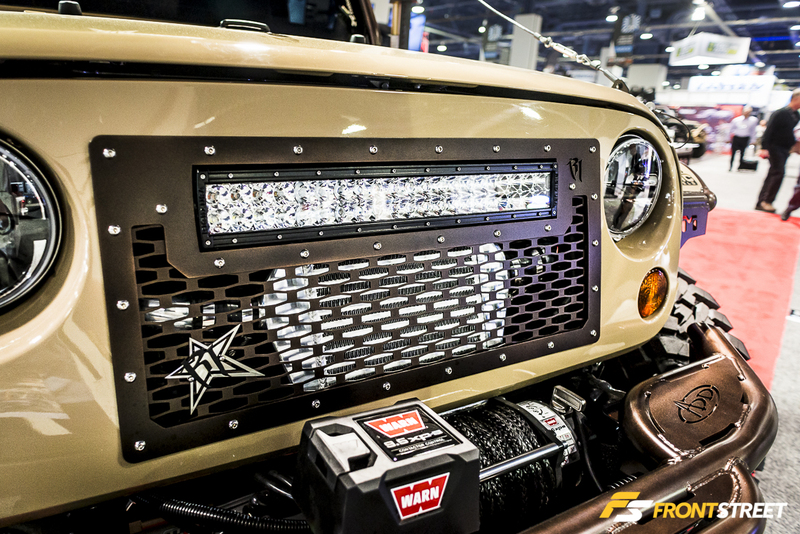 Rigid Industries LED Lighting covered this JK Jeep Wrangler in lighting solutions for any future adventures. 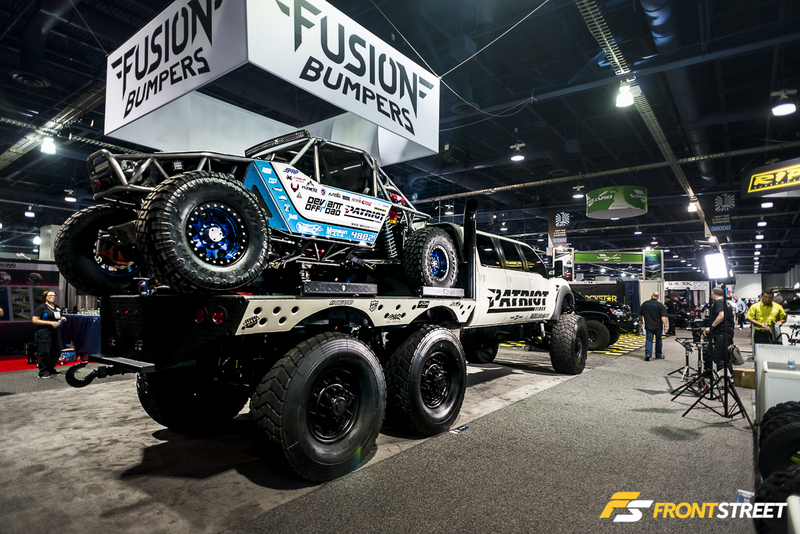 This massive flatbed 6×6 Ford truck would have been a spectacle even without the rock climbing race truck on the back. 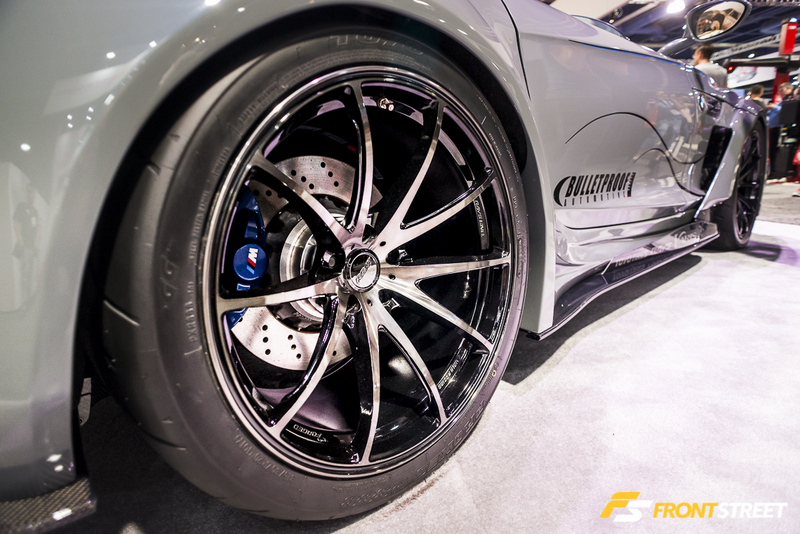 The automotive world’s fixation with over-fenders was still visible in the Forgiato booth on the Liberty Walk Lamborghini Huracan. 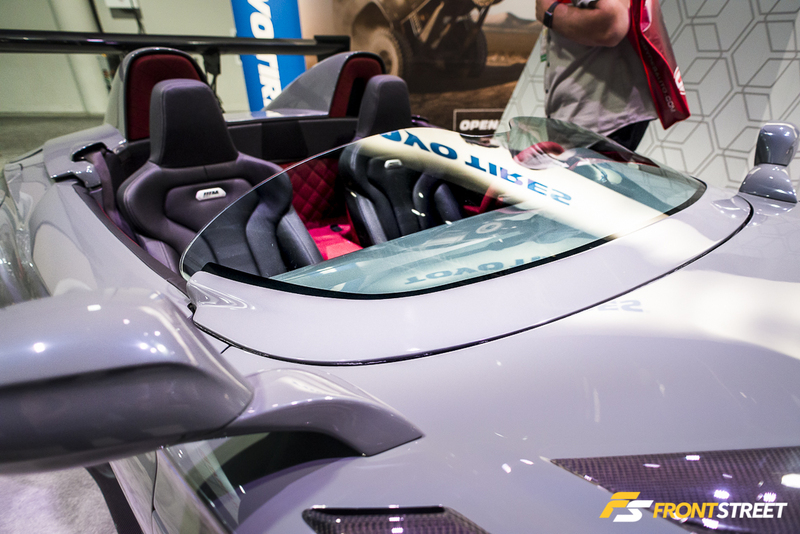 The exotic was equipped with mismatched Forgiato wheel styles on each side. 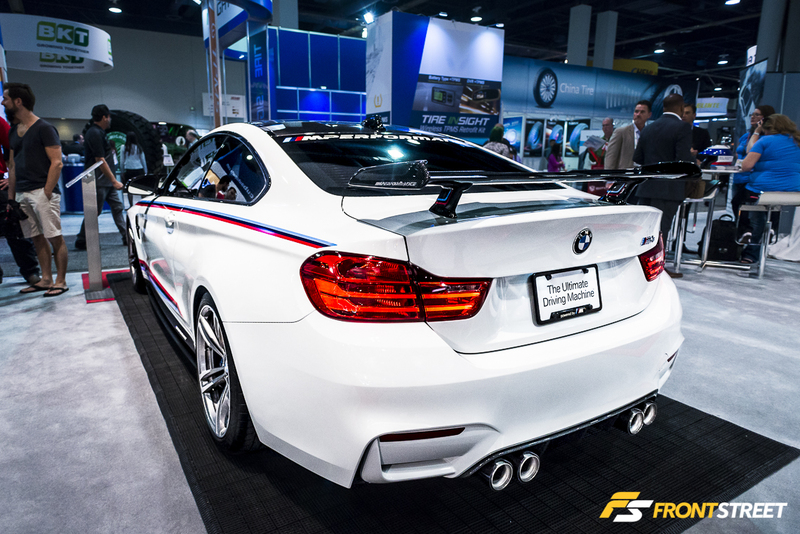 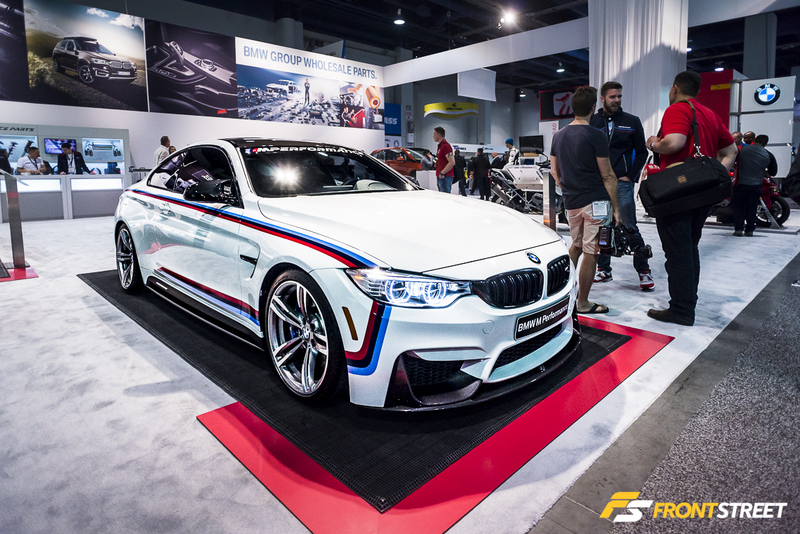 BMW M Performance exhibited their full line of products for the F82 M4 chassis. 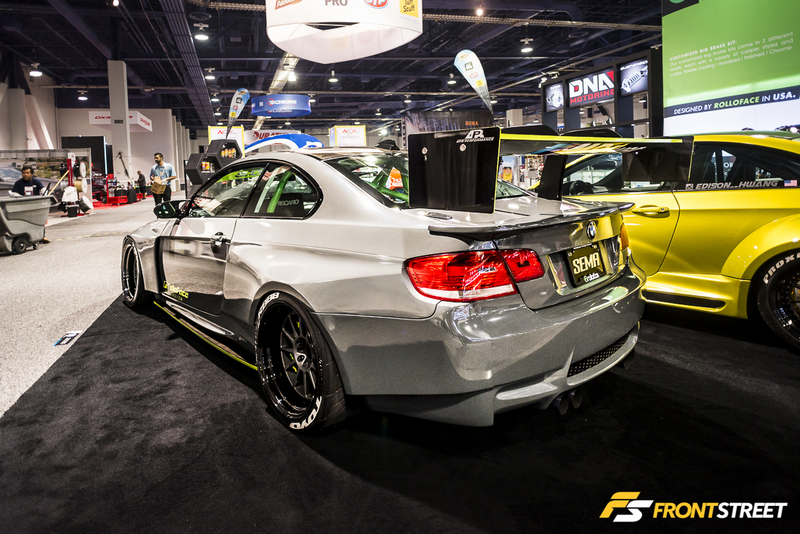 Sarto Racing’s widebody kit made this usually reserved Mercedes-Benz CLK look aggressive atop HRE wheels. 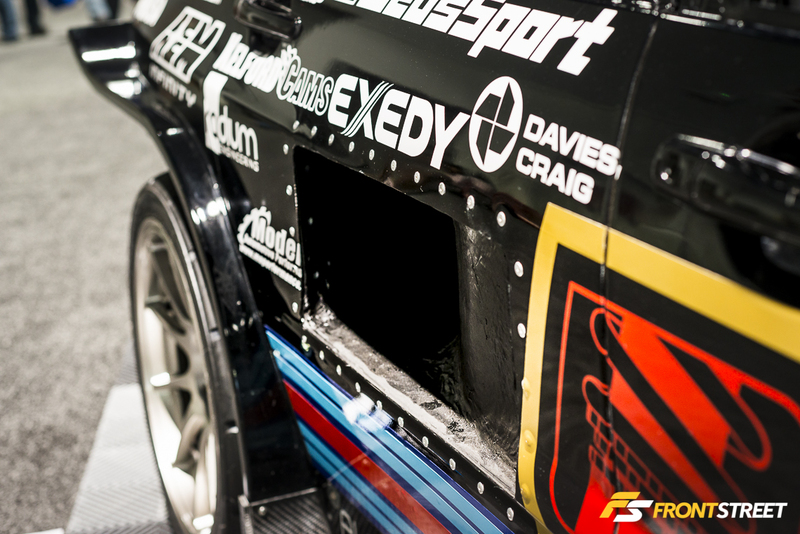 Forgestar’s fleet of RAUH Welt Porsches was inspiring. 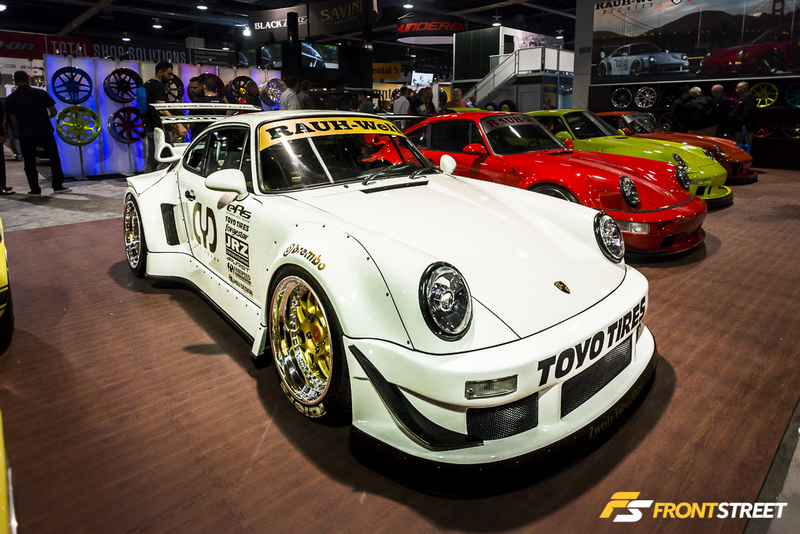 To see the various styles of RWB kits on the different generations showed how diverse the 911 can look. 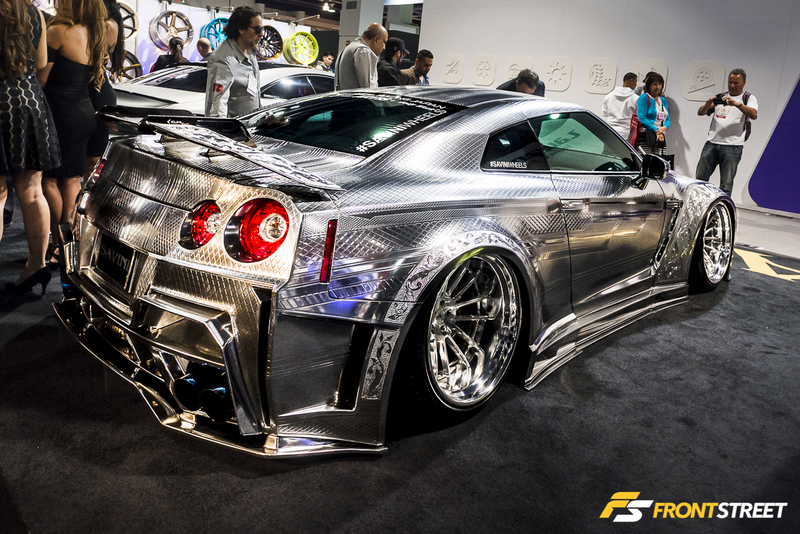 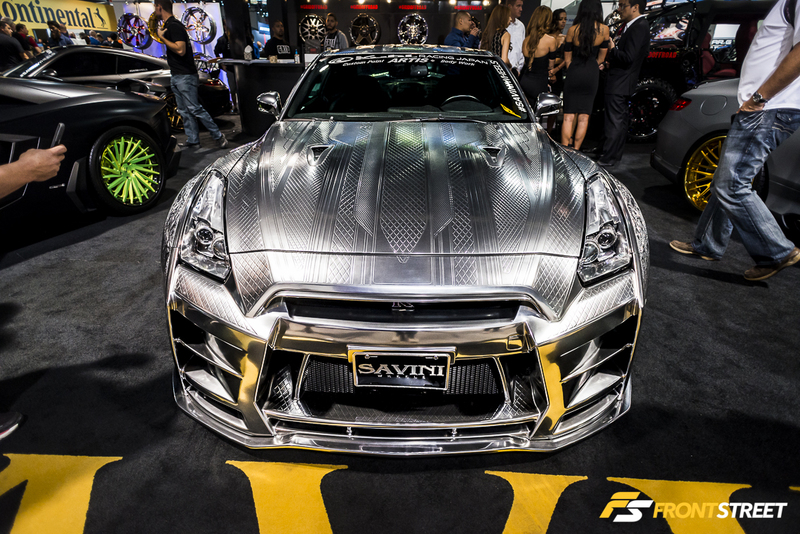 All the way from Japan, Kuhl Racing’s unique R35 GT-R was displayed in the Savini wheels booth. 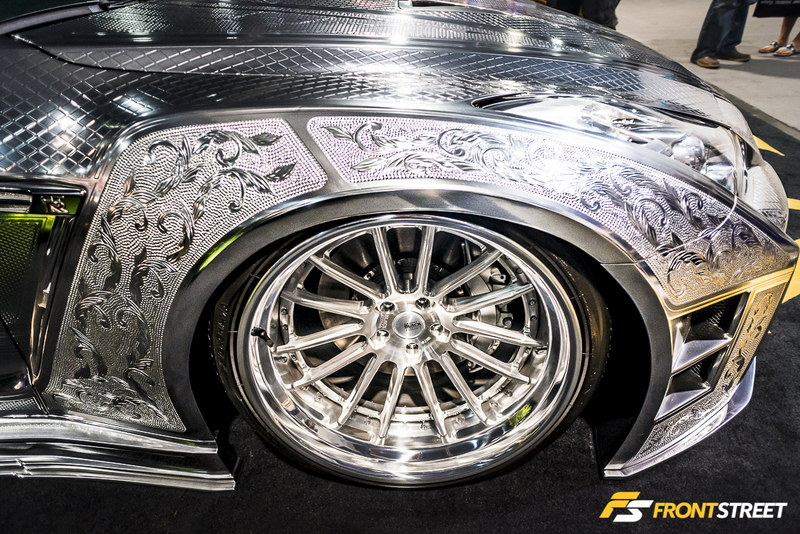 This car is painted, yes painted, in a bright metallic silver color and engraved with intricate designs across the body’s surface. 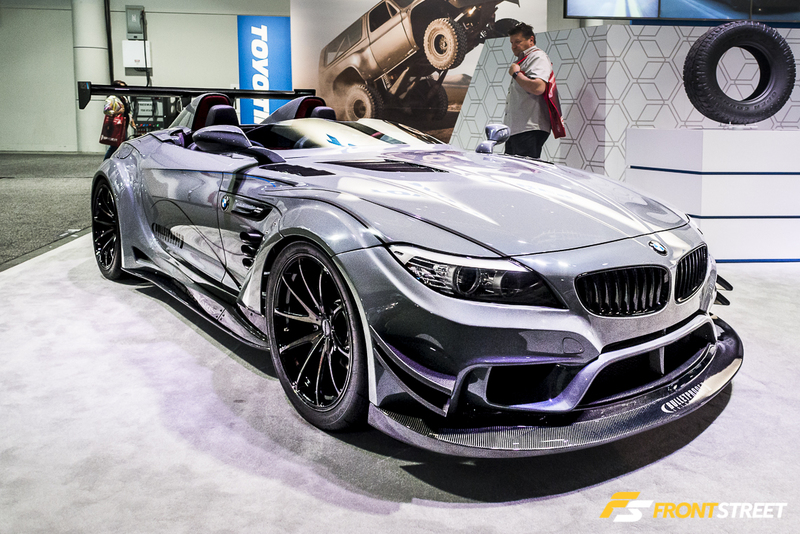 Bulletproof Automotive’s E89 Z4 was converted into an aggressive Varis-widebody futuristic vehicle thanks to its custom windshield, mirrors, and tonneau cover. 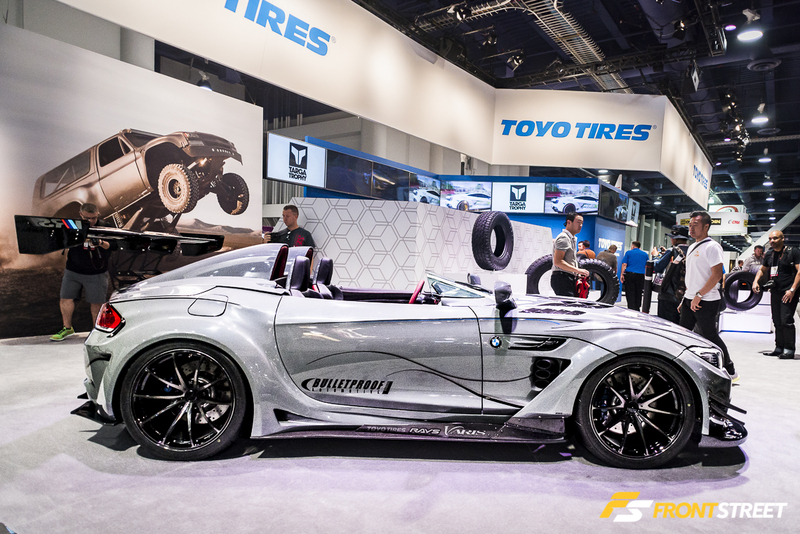 Volk Racing G25 wheels are the ideal addition to the wild exterior of the BMW convertible. 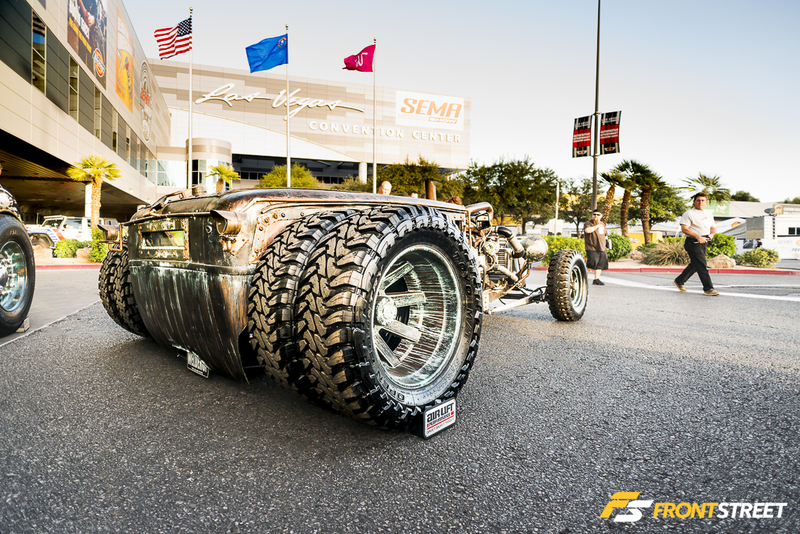 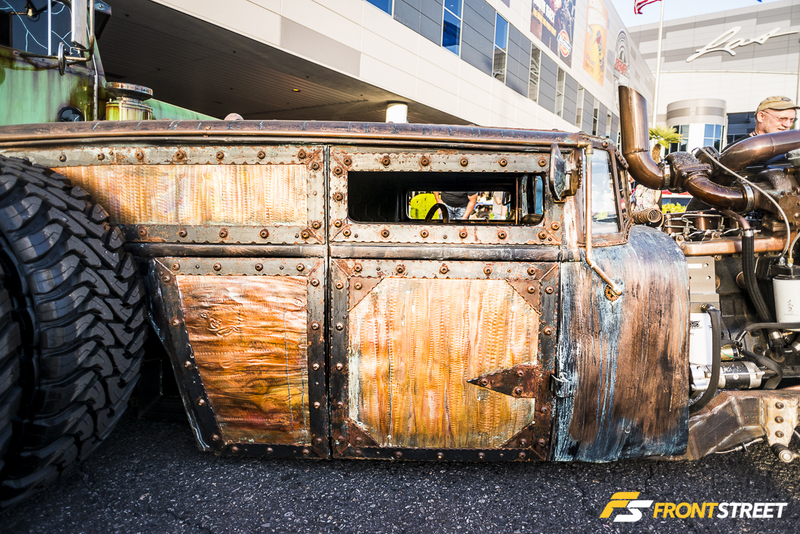 The “Mad Maxxis” Plymouth was a creation perfect for SEMA. 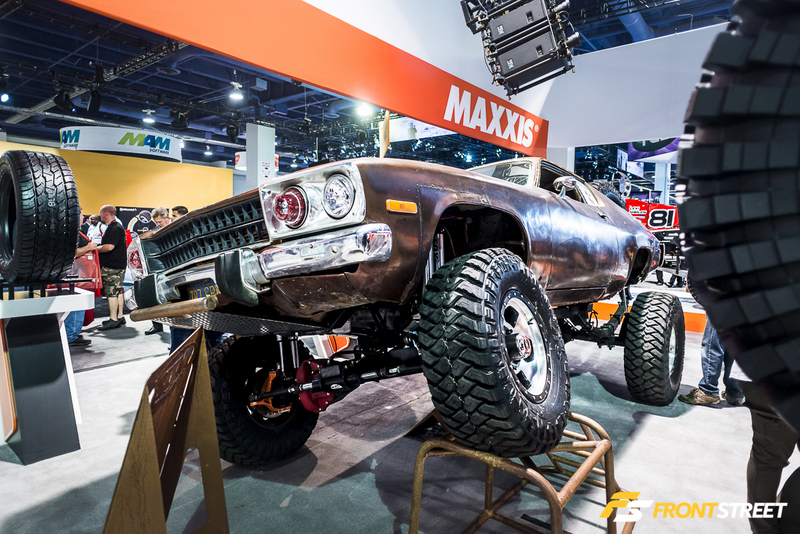 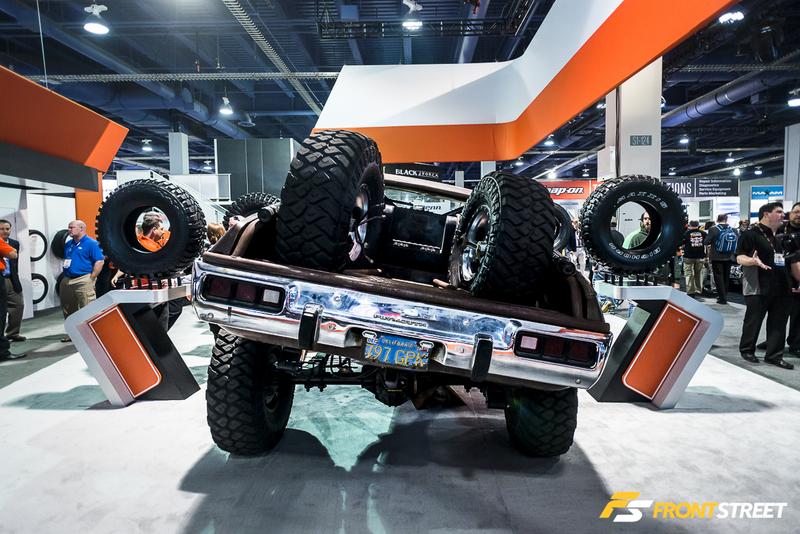 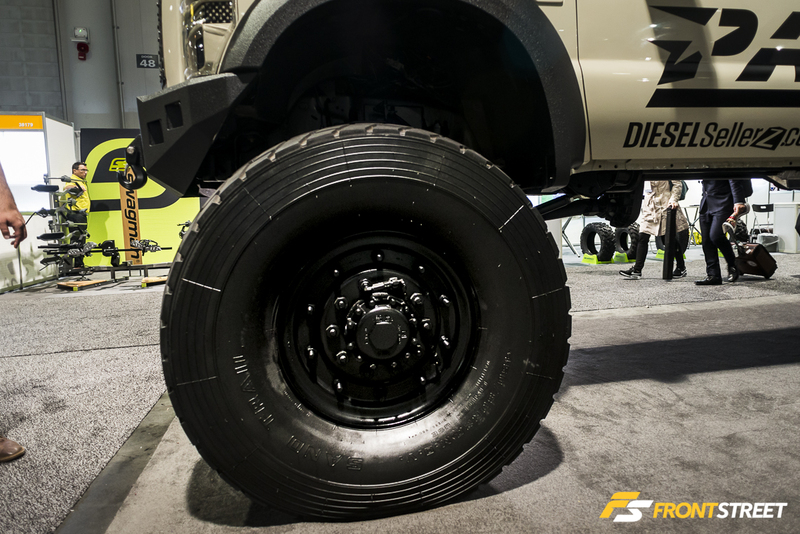 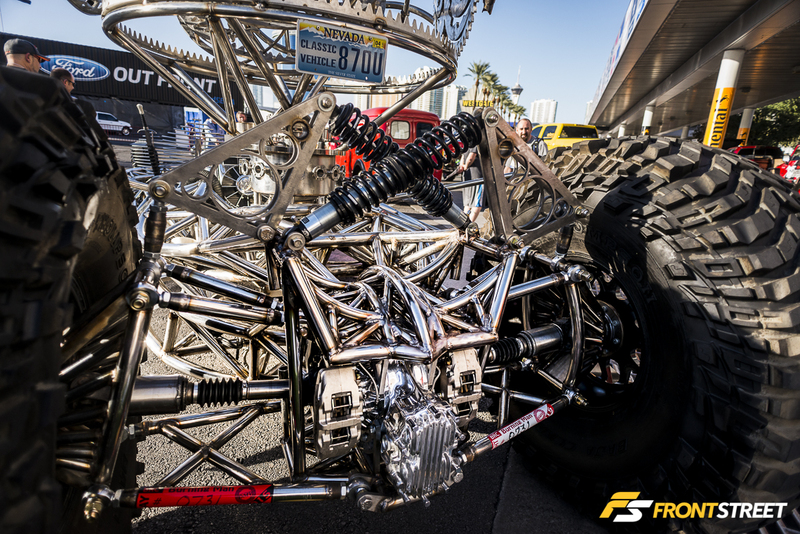 This rugged muscle car was lifted and utilized large offroad tires to flex in the booth. 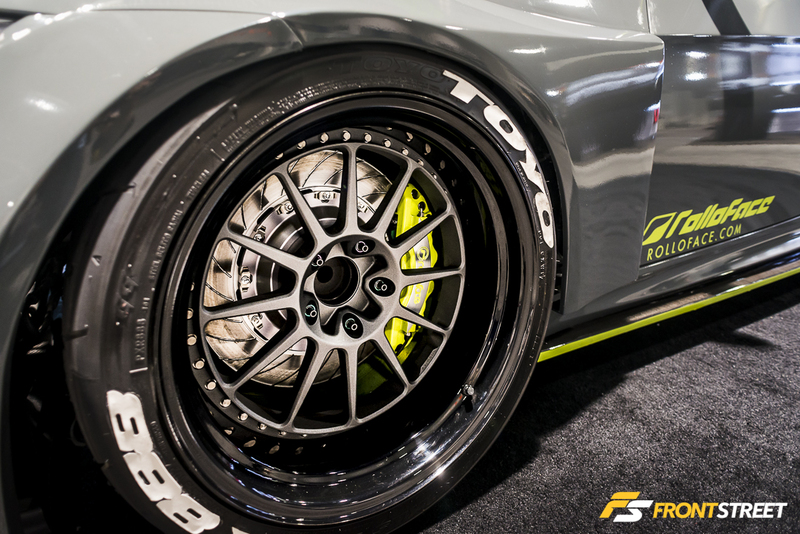 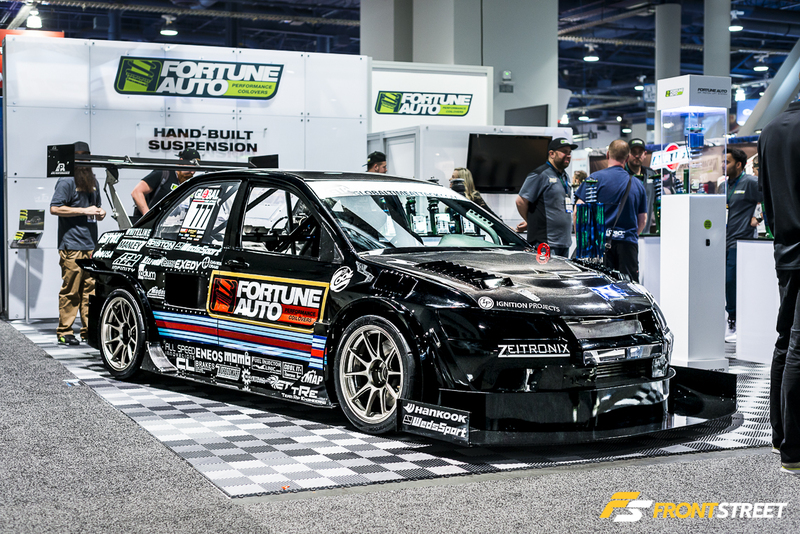 Fortune Auto’s booth was filled with their different coilover variants and their time attack Mitsubishi Evo covered in an array of custom aero. 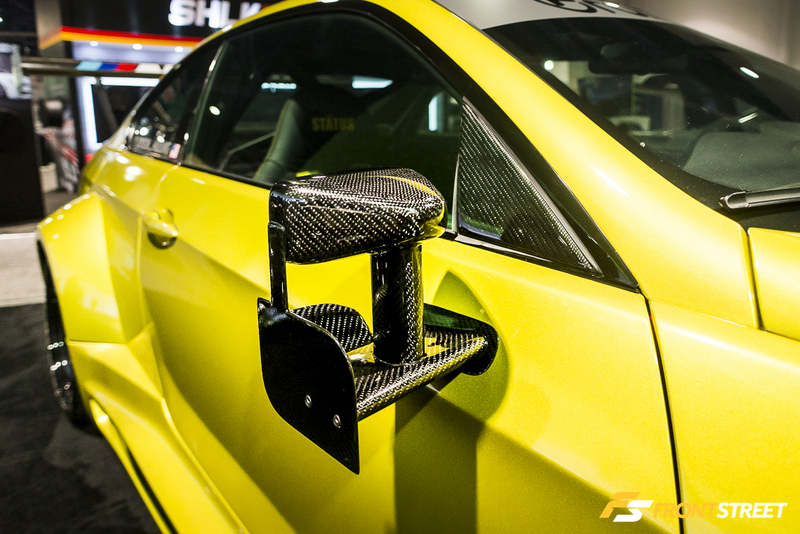 The Evo’s interior has been ditched in favor of large ducting that forces air to necessary destinations. 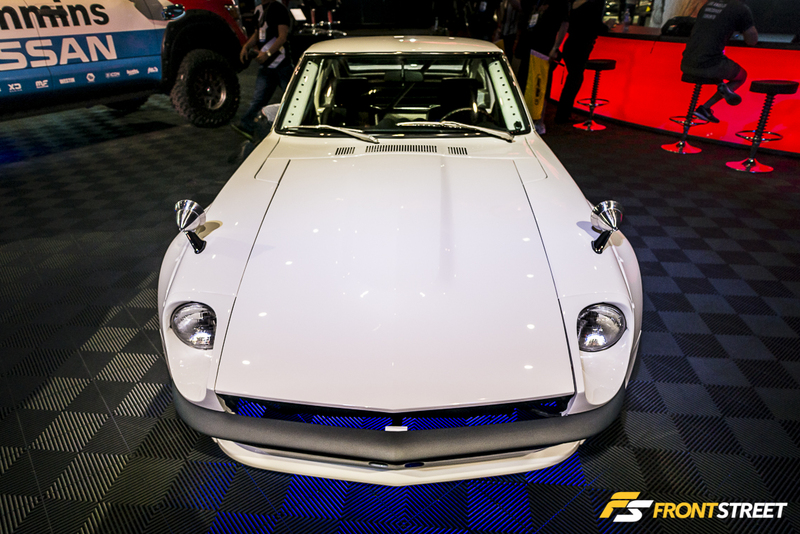 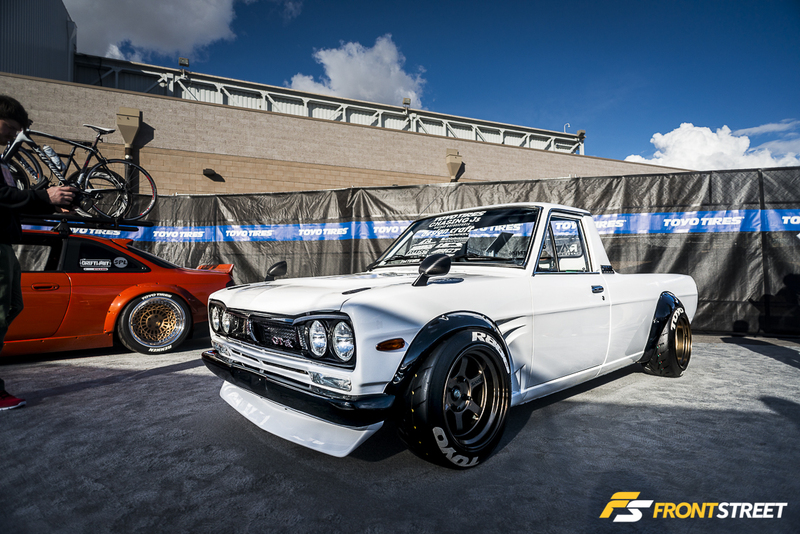 A finalist in SEMA’s Battle of the Builders, this little “Hakotora” combines the clean bodylines of a Datsun Sunny truck with the aggressive Hakosuka Skyline front end. 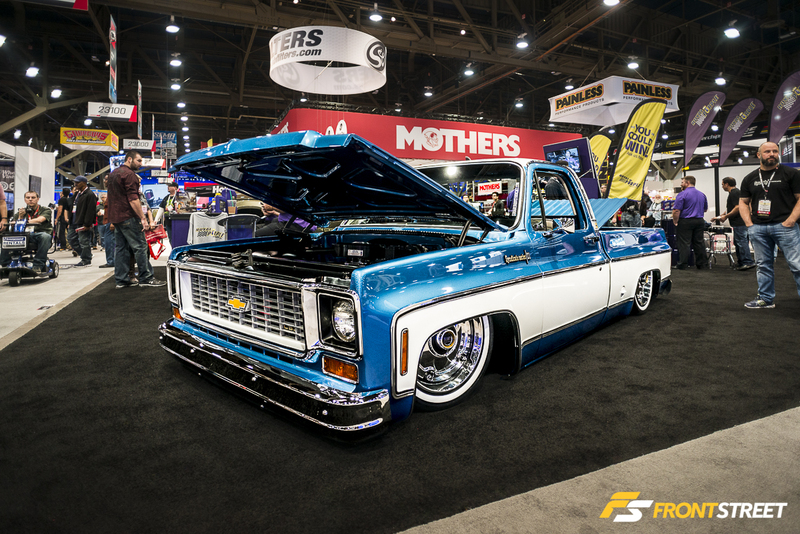 While the entire truck bed was attractively made of carbon fiber, it was the concealed front end that made this truck stand out. 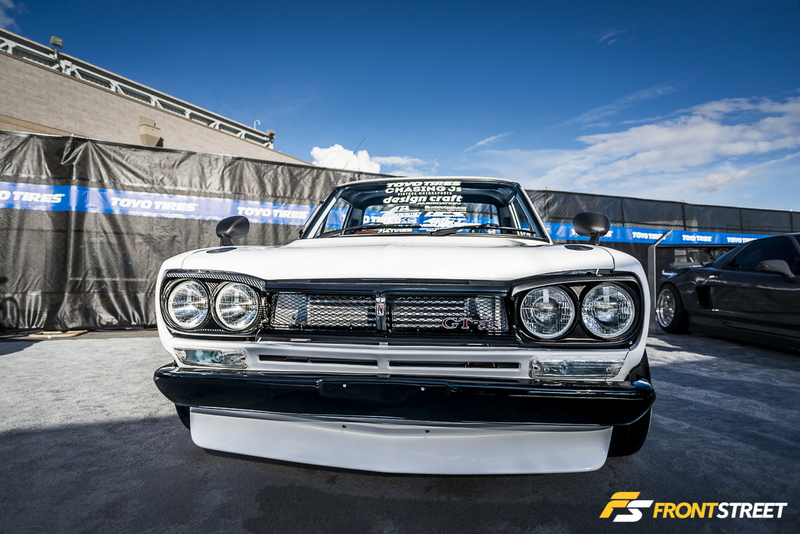 Painted white to match the rest of the truck, the front-end panels of this Skyline front were custom molded in dry carbon fiber with exclusive designs. 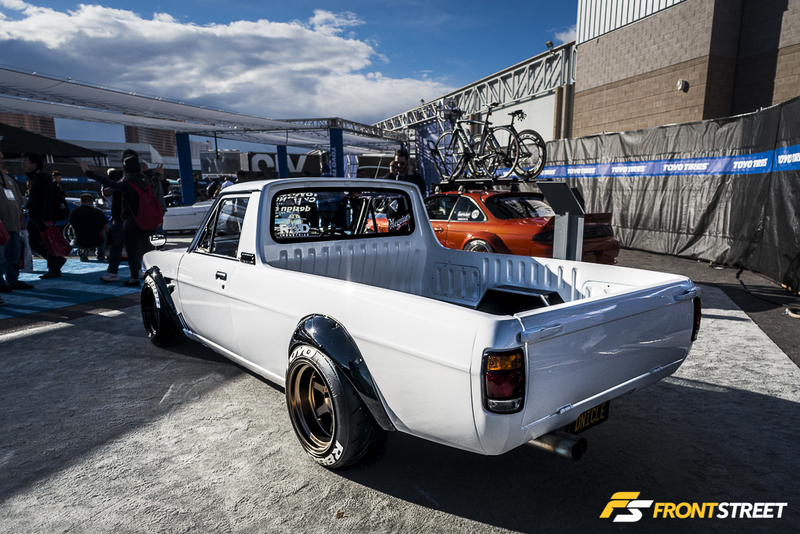 The bronze Volk Racing TE37V wheels wrapped in Toyo R888 tires complete the transformation of the truck. 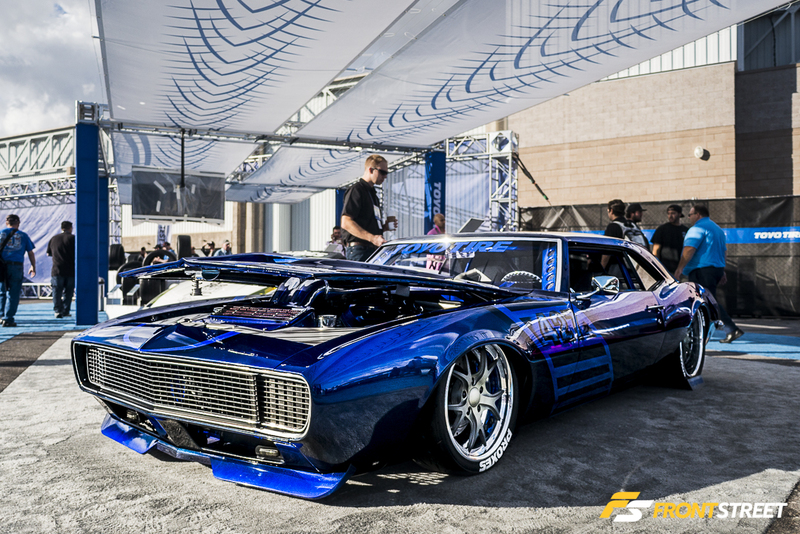 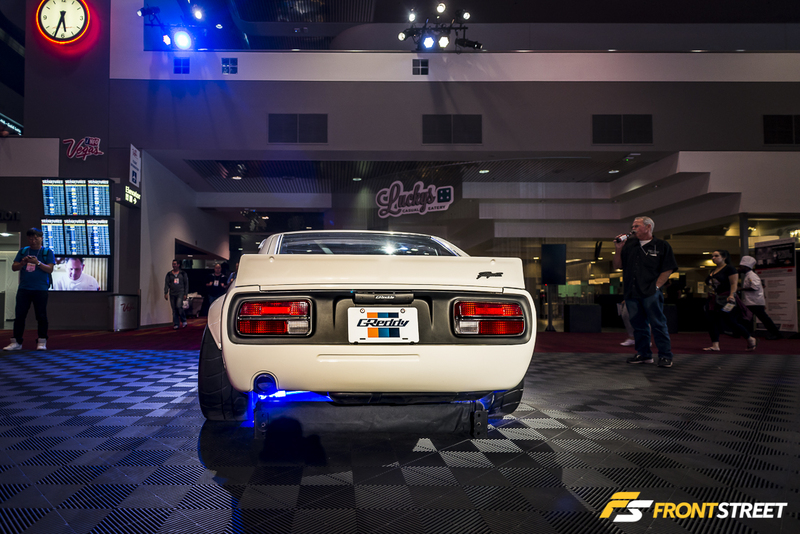 Finishing our first part of SEMA coverage is this restomod Chevy Camaro. 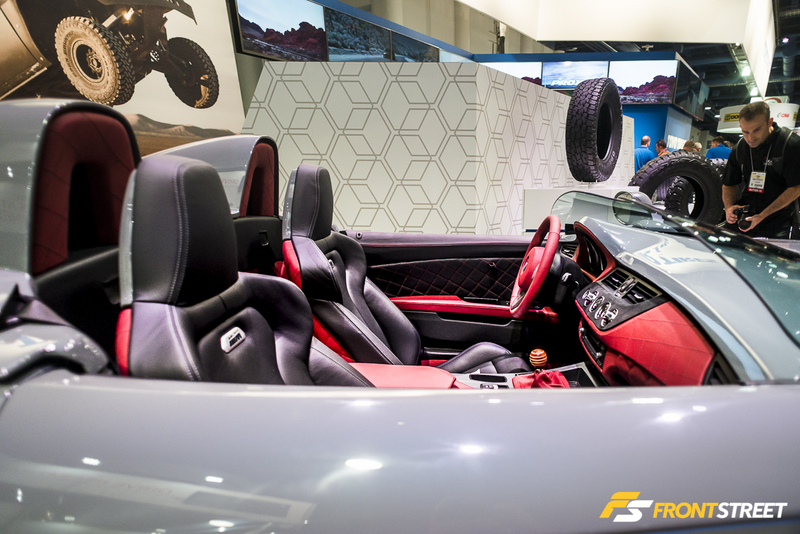 The extremely low airbag equipped ride height is accentuated by the 3” chopped and 3” sectioned body.